The plot of this movie has nothing to do with the Civil War comic, but who cares? “Captain America: Civil War” looks AWESOME! And that last fight scene? Wow, just wow. 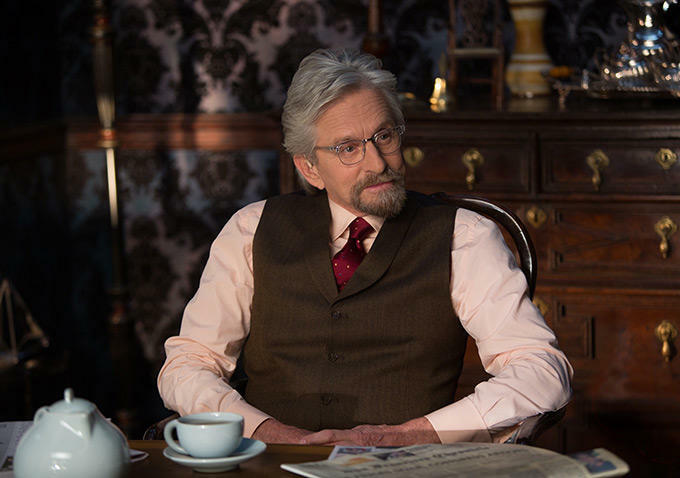 The film takes us back about 25 years, to a time when a brilliant scientist named Hank Pym (Michael Douglas). has already made a once-in-a-lifetime discovery called “The Pym Particle.” The discovery allows a person to shrink the size of organic matter without sacrificing density or strength. After a tragic accident involving his wife Janet, Hank Pym retires from his days as a costumed soldier for S.H.I.E.L.D., cutting off the organization’s access to the dangerous Pym Particle research. Cut to present day where Dr. Pym’s greatest fear ia about to become a reality: his former protegé Darren Cross (Corey Stoll) has discovered the research Pym tried to bury for years, and is close to replicating it in full in the form of the The Yellowjacket. With the help of his daughter Hope, (Evangeline Lily), who working undercover for Cross, Hank puts together a plan to infiltrate his former company and steal The Yellowjacket armor, a deadly suit that would be transformed into a veritable WMD by Darren Cross. However, Hank is too old to don the Ant-Man suit, and he won’t even consider letting Hope take over the role, despite her many pleas. 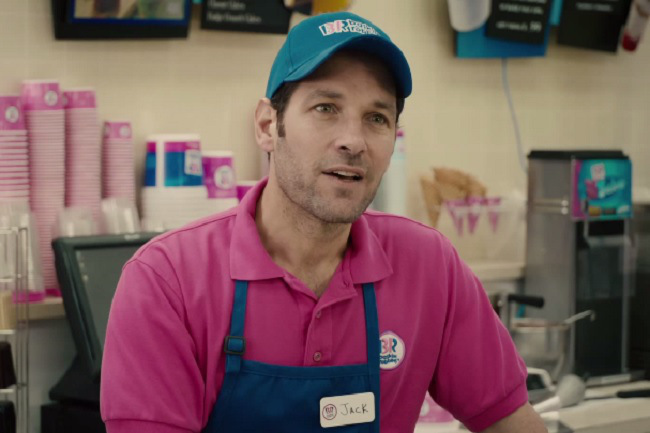 But Dr. Pym has another plan, and soon he places his faith and training in a new recruit: Scott Lang (Paul Rudd). Scott is a recently released convict cat burglar with a Robin Hood complex, who has an estranged young daughter he’s desperately trying to reconnect with. 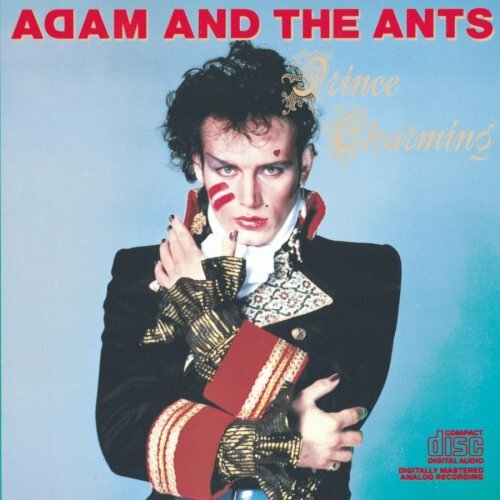 With the Pym’s help, Scott embarks on a wild adventure to become the Ant-Man. Don’t go to the theatre wondering “What If?” Edgar Wright hadn’t left. That ship has sailed, and its time for us to move on. Peyton Reed is now at the helm, and fortunately for us, Reed makes “Ant-Man” a fun cinematic experience in his own style. The director uses some wonderfully creative ideas and wisely relies on the chemistry of the cast to carry the story in between action sequences. 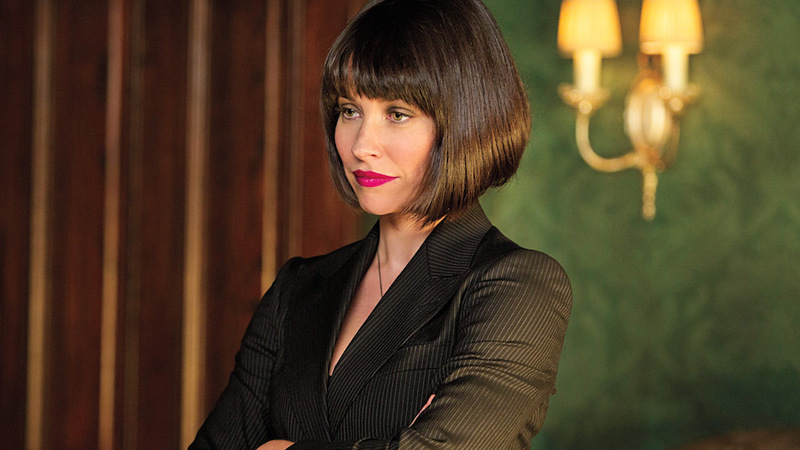 In fact, the best moments in “Ant-Man” come when the “Marvel way” of doing things is put aside in favor of the “Peyton Reed & Paul Rudd comedy show.” Rudd shined when he’s bouncing banter off Michael Douglas, or Evangeline Lily. 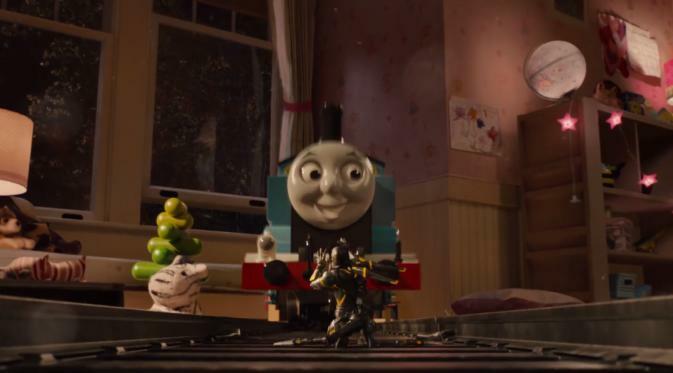 Most of the supporting is solid too, with Douglas actually given something to do for the entire movie. I only wish the movie gave us more Evangeline Lily goodness. Don’t get me wong, she’s in the movie plenty, but I would have loved to have seen her in the Wasp suit just once. I mean come on, instead of a tank it couldn’t have been a Wasp suit in there? (those who saw the movie know what I’m talking about). Paul Rudd’s trio of sidekicks consist of Rapper T.I., David Dastmalchian, and Michael Peña. Its Peña in particular is the film’s main scene-stealer as Scott Lang’s prison buddy/fellow crook, Luis. His way of telling Scott Lang stories is priceless, and one of the movie’s best bits (especially the one story at the end of the movie). The only problem I had with the movie was the villain played by Corey Stoll. Far too often, his Darren Cross blurred the line between mad scientist and Joel Schumacher camp. I never felt like he was a major threat to Scott or the Pyms. It was poor casting in my opinion, but maybe the script didn’t do the man any favors either. 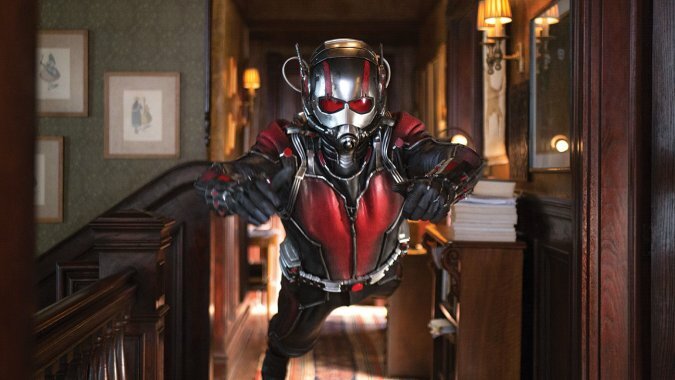 To some, “Ant-Man” will be nothing more than a formulaic Marvel superhero origin tale. 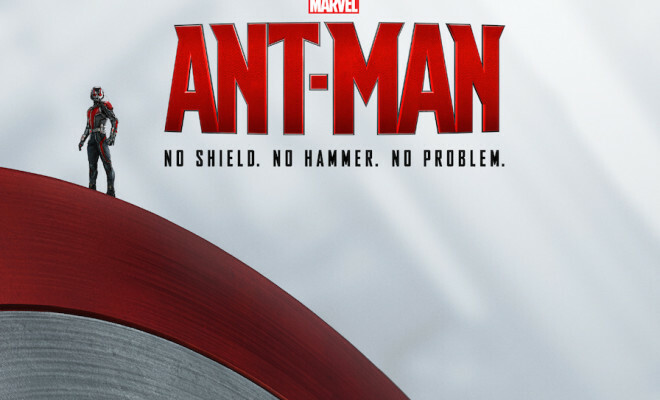 But Ant-Man gets a major boost from a good ensemble cast and its overall fun tone. This is not your typical superhero movie, it’s about family, and I liked that. And I have to give director Peyton Reed credit, because he managed to weave in a few MCU connections, while also managing to introduce the Phase Three that is to come. “Ant-Man,” Marvel’s latest superhero film debuted at number one with an estimated $58 million this weekend, falling just short of expectations. With the win, Marvel is now 12 for 12 for #1 openings (and that includes 2008’s “The Incredible Hulk” released by Universal). “Ant-Man” was the widest release ever for a Marvel produced movie, but its important to remember that the movie was never expected to reach Iron Man or Avengers-level numbers at the box office. And the $58 million debut isn’t too far behind from the debuts of “Captain America: The First Avenger” ($65.1 million) and “Thor” ($65.7 million). 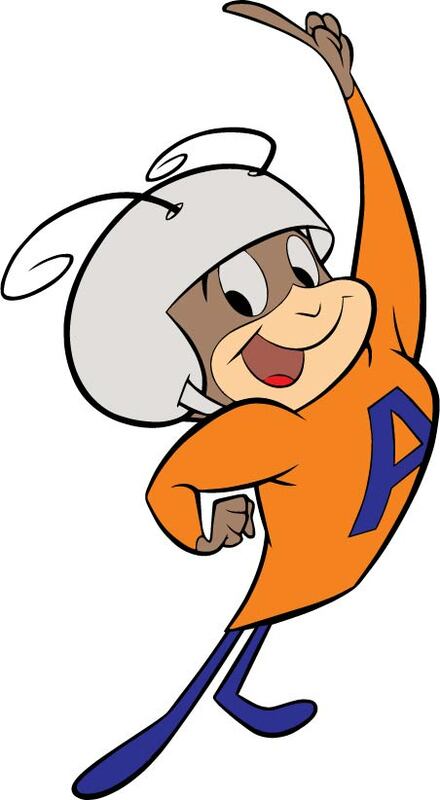 Where “Ant-Man” goes from here is anybody’s guess. But at least the Paul Rudd superhero film has an “A” CinemaScore. I deserve my own movie too! The big surprise of the weekend was the R rated comedy, “Trainwreck.” Even though the film finished in third place with an estimated $30.2 million, that’s well above early predictions, which had Amy Schumer’s film debut finishing somewhere in the mid to high teens. The movie has an A- CinemaScore, and made $9,575 per theater in 3,158 venues. Not surprisingly, 66% of the audience for “Trainwreck” was female. The solid debut is director Judd Apatow’s second best opening weekend ever, coming in just under “Knocked Up,” which made $30.9 million in 2007. Meanwhile, last week’s number one movie, “Minions,” took a pretty good hit this week. The movie was down 57 percent in its second weekend, falling to an estimated $50.2 million. Following the events of “Captain America: The Winter Soldier,” Age of Ultron finds the heroes on a global campaign to destroy what’s left of Hydra and secure any alien technology before it falls into the wrong hands. The crusade brings the Avengers to the base of Baron Strucker – a Hydra officer who has been experimenting on Loki’s scepter in the hopes of harnessing its power. 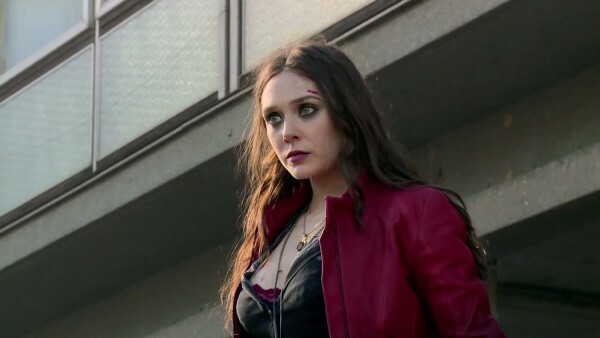 In their assault on Strucker’s compound, The Avengers meet a pair of “enhanced” enemies, Quicksilver (Aaron Taylor-Johnson), Scarlet Witch (Elizabeth Olsen)– as well as a ton of scientific data that, when paired with Tony Stark’s own artificial intelligence advances, has the potential to protect Earth from any threats. However, in his effort to protect the world from future threats, Stark creates his worst nightmare instead: Ultron, a destructive A.I. force hell-bent on destroying earth, and seeking revenge on his creator. Back for the fun are Captain America (Chris Evans), Iron Man (Robert Downey, Jr.), Black Widow (Scarlett Johansson), the Hulk (Mark Ruffalo), Hawkeye (Jeremy Renner), Nick Fury (Samuel L. Jackson, and Maria Hill (Cobie Smulders). The film’s villain is of course Ultron, played by James Spader (more on him later). The latest Avengers team-up delivers everything that fans have come to expect from Marvel’s cinematic universe: globe-trotting adventures, epic CGI battles, future shared universe setups, plenty of comic book easter eggs, good old-fashioned character drama, and one of the more memorable Stan Lee cameos. 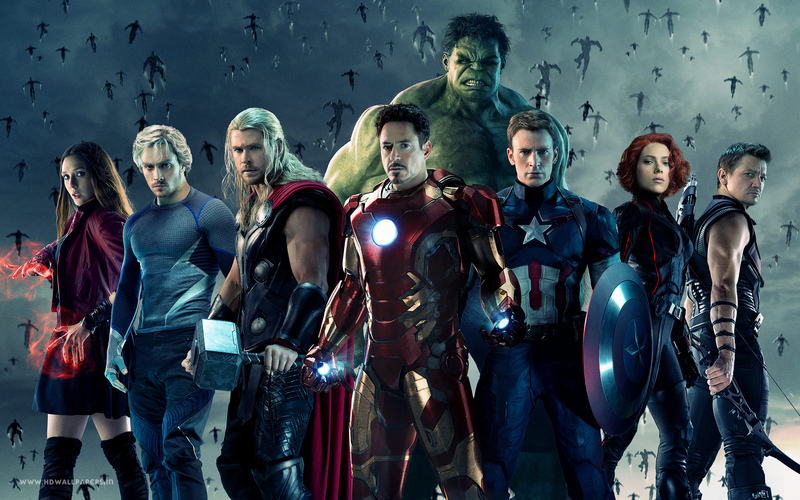 So why are so many critics and fans unhappy with Age of Ultron? Probably because this is one crowded movie! Although there’s been several films since the first Avengers in 2012, it feels like we’re just getting to know them as a team. But because Age of Ulton adds Quicksilver, Scarlet Witch, and the Vision, and it has a slew of cameos, we don’t get as much time with the core Avengers group as we’d probably like. But don’t get me wrong: I love the new additions to the team. … It pains me to say this, but he was just okay. I think my biggest problem with him was that I couldn’t get “Red” Reddington from “The Blacklist” our of my head. Had Spader not played a charismatic villain for the last couple of years, his Ultron would have made more of an impact. As you know by now, Age of Ulton is Joss Whedon’s swan song to the Marvel universe. I don’t have a problem with him leaving, this type of movie has to take its toll on a person. What I don’t like is the way he’s leaving. On his way out the door, the director has burned every bridge he had with Marvel/Disney. Whatever happened between Whedon and the studio must have been major. But considering Whedon is now known worldwide thanks in large part to Marvel, I wish he’d leave with a little more class. But that’s just me. 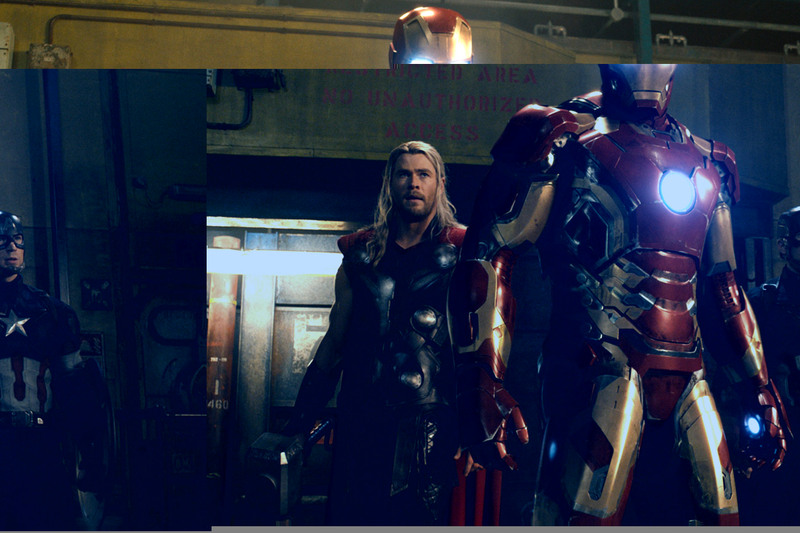 Maybe the friction between the director and the studio hurt the movie, because the story in Age of Ultron could have used a little polish. But the movie is still filled with brilliant one liners and just damn awesome moments for us long time comic geeks. 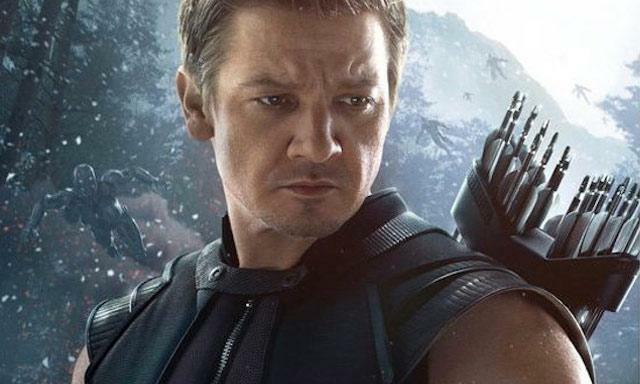 The biggest surprise of the film is Clint Barton (Hawkeye) – who enjoys the most character development, and has the mos relatable role in Age of Ultron. Whereas Barton spent most of the first movie as a mindless drone, he becomes a powerful cipher for the audience this time around. It was nice to see how a normal guy handles standing shoulder-to-shoulder with gods and enhanced super soldiers, risking everything, to protect innocent lives. The character arc only works because of Jeremy Renner. He brought more life and humanity into Hawkeye (as well as the entire team) than ever before. The sequence at his house is one of the best in any Marvel movie. While I had a couple of minor complaints, I still loved “Avengers: Age of Ultron.” It’s one of the better entries to he MCU, and its definitely better than “Iron Man 3” and “Thor: The Dark World.” I for one can’t wait to see what happens next! Seems like fans across the board are very happy with this news, as am I. 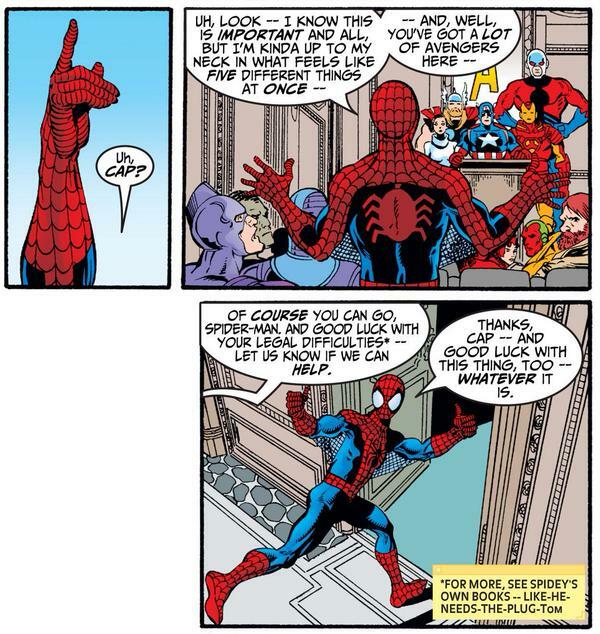 The mere thought of having Spidey interact with the Avengers mas me giddy. 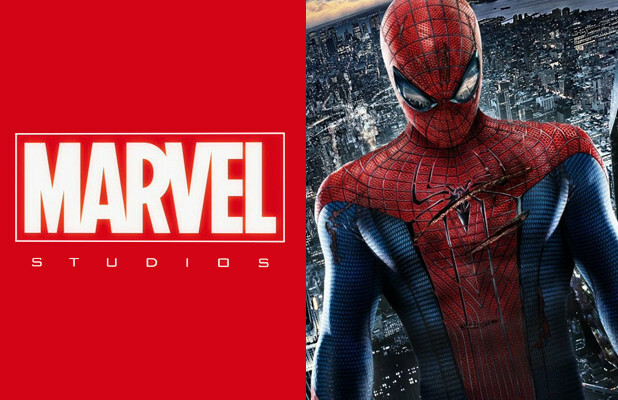 The only one who probably isn’t very happy right now is Andrew Garfield, who is likely out as Spider-Man. He wasn’t perfect as Peter Parker, but I liked him better than Tobey Maguire in the role. Personally, I wouldn’t mind a more adult version of Spider-Man in the movies. My entire comic book reading life, the 616 Peter Parker has been an adult working hard to pay his bills. I don’t know about you, but I’m tired of seeing the movie version of Peter Parker in high school or college. But if Marvel decides to do another teenage version of Spider-Man, then why not try something new, and introduce Miles Morales to the cinematic universe? That would reignite interest in the Spider-Man character and likely bring in new fans to the movies and the comics. 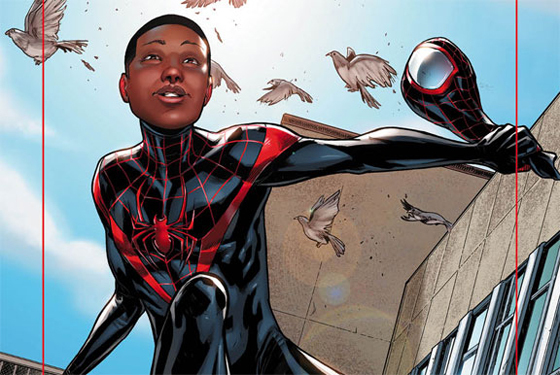 However, if they go with Miles Morales, please cast an actual teenager this time, okay Marvel? In case you missed it, here’s the new trailer for “Avengers: Age of Ultron.” And because you demanded it true believer: Now with more Black Widow! 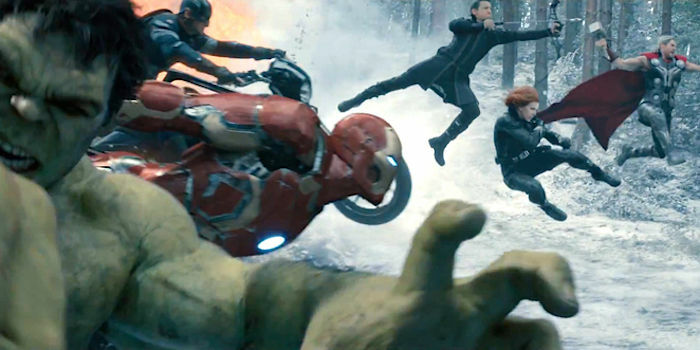 “The Avengers: Age of Ultron” hits theatres on May 1, 2015.